This Celtic necklace for men, like all the Irish made jewelry at The Irish Gift House, is nickel free and hypoallergenic. 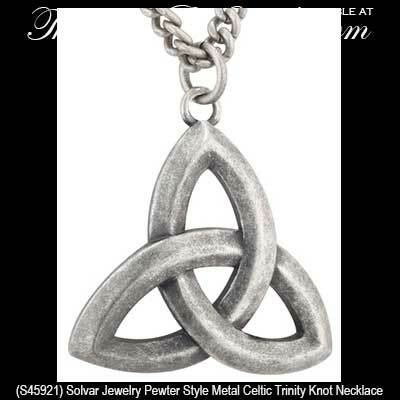 This pewter style metal men's Celtic necklace features a heavy weight and thick dimensional Trinity knot. The Trinity pendant measures 1 1/2" wide x 1 3/4" tall, including the jump ring and the chain bail, and includes a heavy 26" long metal chain with a lobster claw clasp. 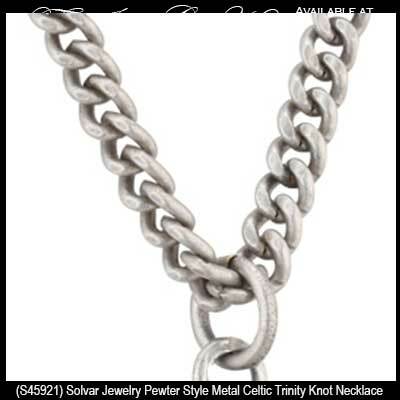 The Trinity necklace is gift boxed with a Celtic knot history card, compliments of The Irish Gift House and it is from the Celtic Man Collection from Solvar Jewelry. This masculine Celtic pendant is made in Dublin, Ireland.